Join the 7th Annual State of Search Conference 2018, on October 10th & 11th in Dallas, TX. The attendees of this conference come each year from across the world to be a part of. 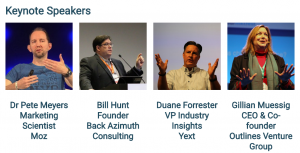 The state of search conference 2018 is two days of world-class speakers, four-session rooms with topics covering Agency growth, Enterprise and eCommerce, SEO, PPC, Analytics, and Social Media Marketing, all featuring industry experts from across the world.